So as you may have read from Saturday's post that we recently sent out the invitations to Darcie's first birthday and as promised I am going to share with you! Our gorgeous invitations were made by Vista Print and I have been VERY impressed. Sorry for the horrible edit but didn't want to share my details! This was a pre-set design that we added her picture to, changed the colours slightly and I'm so pleased with the way it looks. We opted for a more luxurious finish with the paper choice and it looks and feels beautiful. 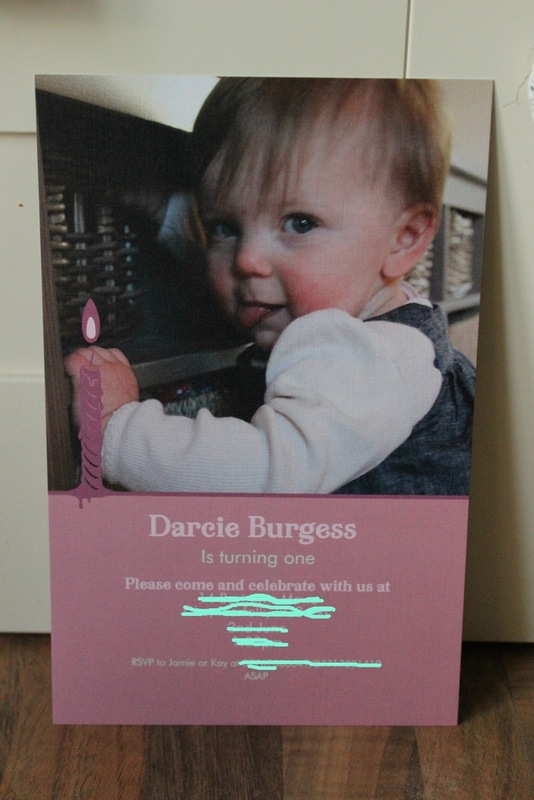 Vista Prints website was very easy and straight forward to use and within no time we had the perfect invitation for our little ones first birthday. I thought the price of the invitations where actually very good, for the quality that you couldn't get in shop bought ones. The only two criticism was the postage charge (we did not select the expensive option either) and the fact that the envelopes were too small. When I tweeted them about the envelopes they were more than happy to help. I am so happy with the results, I would definitely recommend Vista Print if your looking for something special in an invitation.